When you combine selections as you've just done, small unselected gaps can remain between the two loaded selections. In this task, you'll review the selection and repair any holes that may be there. 1 Using the zoom tool ( s), zoom in to the image so that the area where the two pears overlap fills the image window. 2 In the toolbox, click the Quick Mask Mode button (J), or press Q to select it with the keyboard shortcut. All the areas in the image that are not included in the selection appear with a 50% red tint. You can double-click the Edit in Quick Mask Mode button to open the Quick Mask Options dialog box, where you can change the opacity and color of the tint that indicates the unselected areas. 3 Look closely at the area where the two pears overlap to see if there are any red pixels there. 4 In the toolbox, make sure that the foreground and background colors are black and white, respectively, or click the small Default Foreground And Background Colors button to reset them. 5 Select the eraser tool (-■ ) and drag it over the area between the two pears to erase any red tint that appears there. If necessary, you can adjust the diameter of the eraser tool in the options bar. Continue erasing until there are no more red pixels in that area. The next phase of your job is a simple task: moving the selection to another area of the image. This sets the stage for the final work, creating a different effect in the shape of the pears. 1 In the toolbox, click the Standard Mode button (_I), or press Q. 2 Double-click the zoom tool ( 0 so that the entire image fits in the image window. 3 In the toolbox, select the rectangular marquee tool ( ,). 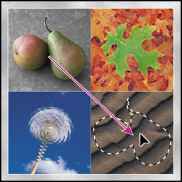 4 Move the pointer inside the pear selection and then drag the selection marquee (not the pear images) into the lower right quadrant, centering it over the sand image. If you want to move the selection at exactly a 45° angle, start dragging and then hold down Shift. 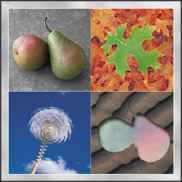 In this task, you'll use your selection and some layer styles to create the illusion of a cutout in the sand image. Make sure that your combined pears-shaped selection is still active. If you have accidentally deselected, you'll have to start this process over, beginning with "Combining selections" on page 380. 1 In the Layers palette, click the Sand layer to make it the target layer. 2 Choose Layer > New > Layer via Copy to create a new layer above the original Sand layer, based on your combined selection. The new layer automatically becomes the active layer in the Layers palette, and the pears-shaped marquee disappears. You can quickly create a selection marquee around a layer by Ctrl+clicking (Windows) or Command+clicking (Mac OS) the layer name in the Layers palette. You can try this with the new Layer 5 to make the pear marquee reappear. Before you continue with this lesson, choose Select > Deselect. 3 At the bottom of the Layers palette, click the Add A Layer Style button (<«) and then select Pattern Overlay from the pop-up menu. 4 Drag the Layer Style dialog box aside, as needed, so that you can see both the dialog box and the image window. Notice the long, narrow arrow button to the right of the Pattern display near the center of the dialog box. 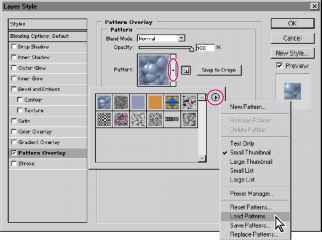 5 Click the Pattern arrow to open the pattern picker, which displays small thumbnails of an assortment of patterns. 6 Click the small arrow button in the upper right area of the pattern picker to open the menu, and select Load Patterns. 7 In the Load dialog box, go to the Lessons/Lesson12 folder and select the Effects.pat. Click Load. When the dialog box closes, notice the new pattern that appears as the last thumbnail in the pattern picker. 8 Select the pattern thumbnail you added in step 7. The pattern replaces the default pattern inside your pears selection. At this point, you can drag the pattern in the image window to adjust the area of the pattern that appears in the selection—even without closing the Layer Style dialog box. You can continue to experiment with other Styles and settings until you create results that you think are interesting. 10 When you are satisfied with the results, click OK, and then save your work. 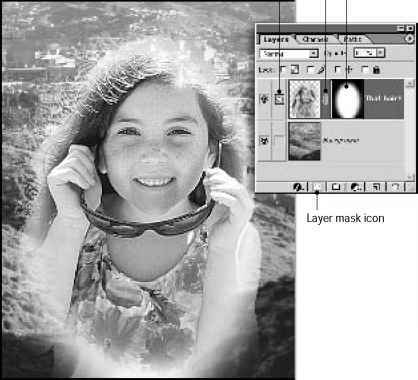 You have completed Lesson 12.
tp For detailed information on individual filters and a gallery of examples, see "Using filters" in Photoshop 7.0 online Help. This concludes this lesson. On your own, you can try out other filters to see how you can add different effects to your images.